Get a FREE $5 Menchie’s Frozen Yogurt Reward! 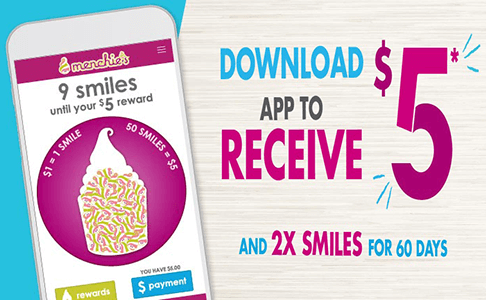 Menchie’s is offering up a FREE $5 Menchie’s Money Reward when you download their new app from the Apple App Store or Google Play Store! Just head into your local Menchie’s with this $5 reward offer and get free treat! Note that the $5 reward may take up to 12 hours to appear in your account. You will also get BIRTHDAY TREAT $5 menchie’s money to celebrate your special day.